Anthony S. Tadros, M.D., Tan B. Nguyen, M.D., Brian R. Curtis, M.D., Brady K. Huang, M.D., and Donald L. Resnick, M.D. A 68 year-old male presents after being injured during a motor vehicle accident. Fat-saturated T2-weighted coronal (1a) and sagittal (1b,c) images, as well as fat-saturated proton density-weighted axial images (1d,e,f) are provided. What are the findings? What is the most likely diagnosis? (2a)-(2f) There is a complete tear of the anterior cruciate ligament at the junction of the middle and distal thirds (solid arrows), complete tear of the tibial collateral ligament at its femoral attachment (open arrows), high-grade tear of the deep medial meniscofemoral ligament (open arrowhead), and extensive tearing, predominantly horizontal, of the body and posterior horn of the medial meniscus (solid arrowhead). There is also partial-thickness tearing of the medial patellofemoral ligament at its femoral attachment (short arrow). The medial supporting structures are the most commonly injured ligaments in the knee. Most medial knee injuries are isolated and occur in young active patients participating in sports.1 Knowledge of the anatomy and patterns of injury of these structures is crucial for early and correct diagnosis by clinical examination and magnetic resonance (MR) imaging. Clinically, the accurate identification of injuries to the medial supporting structures, as well as to the lateral and centrally located structures, is based, at least in part, on the results of provocative stress testing of the knee. With MR imaging, it is often the “footprints” left behind after an injury to the knee that provide the most helpful clues to the observer. These footprints include abnormalities in morphology and signal intensity within and around the injured ligament itself, as well as the distribution and magnitude of the associated injuries to cartilage, bone, and menisci. The medial supporting structures of the knee can be divided into layers, as first described by Warren and Marshall.2 These investigators described the medial aspect of the knee as consisting of three layers: superficial, intermediate, and deep (Figure 3). The superficial layer, or layer I, consists of the deep crural fascia, which is intimate with the fascia of the vastus medialis and sartorius muscles. The intermediate layer, or layer II, primarily consists of the tibial collateral ligament (TCL), the more superficial portion of the medial collateral ligament. Anteriorly, the intermediate layer fuses with the superficial layer to form the medial patellar retinaculum. Beneath layer I, the gracilis and semitendinosus tendons can be found. The deep layer, or layer III, is formed by the deep medial capsular ligament and joint capsule. Posteriorly, the deep layer fuses with the intermediate layer via the posterior oblique ligament (POL).2,3 While this layered model is important for understanding the relationship among these structures, many physicians, including the authors of this web clinic, find an anterior to posterior approach as more useful in day-to-day practice when analyzing the medial supporting structures of the knee. Three-layer division of the medial supporting structures: The superficial layer consists of the deep crural fascia. The intermediate layer primarily consists of the tibial collateral ligament and fuses anteriorly with superficial layer to form the medial patellar retinaculum. The deep layer is formed by the deep medial capsular ligament and joint capsule and fuses posteriorly with the intermediate layer via the posterior oblique ligament. The MPFL originates just anterior and distal to the adductor tubercle of the femur, with an additional oblique decussation originating from the proximal leading edge of the TCL, and courses in a horizontal fashion to join the vastus medialis oblique tendon before inserting on the superior aspect of the patella. Axial proton density-weighted images demonstrate the normal femoral attachment of the MPFL (arrows) as it passes over the TCL (open arrows) (5a) and (5b). In another patient, axial proton density-weighted images demonstrate disruption of the femoral attachment of the MPFL with adjacent edema as it passes over the TCL (arrows 5c and 5d). The pes anserinus tendons (sartorius, gracilis, and semitendinosus) attach to the anteromedial aspect of the tibia. Although significant anatomic variation exists with regard to the individual attachments of these tendons, they are generally arranged in a linear fashion with the sartorius tendinous attachment most proximal, followed by the attachments of the gracilis and semitendinosus tendons.4,7 The pes anserinus bursa is deep to the pes anserinus tendons and superficial to the TCL; when inflamed, the distended pes anserinus bursa produces a mass along the medial or anteromedial aspect of the proximal portion of the tibia (Figure 6). Axial (a) and coronal (b) fat-saturated T2-weighted images demonstrate fluid with synovial proliferation within the pes anserinus bursa (asterisk), compatible with pes anserinus bursitis. In this case, it is likely caused by friction between the bursa and the adjacent osteophytes in a patient with osteoarthrosis. The middle portion of the medial supporting structures consists of the TCL and deep medial capsular ligament. The TCL is a band-like ligament with one femoral and two tibial attachments (Figure 7). The femoral attachment of the TCL is just below the physeal scar of the femur slightly proximal and posterior to the center of the medial femoral epicondyle. The proximal tibial attachment of the TCL is to the anterior, or tibial, arm of the semimembranosus tendon.4 The distal tibial attachment of the TCL is broad, located 6-7 cm below the joint line and deep to the pes anserinus tendons. (a) Coronal proton density-weighted image demonstrates the femoral attachment of the TCL just below the physeal scar (arrow) and the distal tibial attachment 6-7 cm below the joint line (arrowhead). The proximal tibial attachment is not reliably identified with MR imaging. The deep medial capsular ligament consists of the meniscofemoral ligament (open arrow) and the meniscotibial ligament (open arrowhead). (b) Coronal fat-saturated proton density-weighted image demonstrates fluid within the TCL bursa (asterisk), which can be found deep to the TCL and superficial to the deep medial capsular ligament. The posterior portion of the medial supporting structures consists of the POL, oblique popliteal ligament, semimembranosis tendon, and tendon of the medial head of the gastrocnemius muscle. The POL consists of the superficial arm, central arm, and capsular arm. The distal semimembranosus tendon consists of five arms: tibial or anterior (blue arrow), inferior (magenta arrow), direct (red dotted line), oblique popliteal ligament (green arrow), and capsular (orange arrow). There is no classification system of instability patterns of the knee that is uniformly accepted. Currently used classification systems often emphasize one-plane, or straight, instabilities, rotational (i.e., rotary or rotatory) instabilities, and combined instabilities. These classification systems are based on a number of concepts (Figure 9). Patterns of tibial displacement: The vertical axis of the knee passes near the joint center. The tibial plateau is divided into four quadrants for reference (AM,AL,PM,PL). Ligament disruption leads to a shift of the vertical axis in either a straight line (straight instability) or into one of these quadrants (rotary, or rotational, instability). Reference is made to the movement of the tibia on the femur. The vertical axis of the knee normally passes near the center of the joint. The tibial plateau is divided into four quadrants – anteromedial, posteromedial, anterolateral, posterolateral – that are used as reference points. Ligament disruption allows a shift of the vertical axis from the center of the tibia into one of these quadrants. Reference is made to the movement of the tibia with respect to the femur during stress testing. Straight, or one-plane, instability involves abnormal displacement in only one horizontal plane. Four types exist: medial (or valgus), lateral (or varus), anterior, and posterior. Rotational instability involves abnormal rotational movement about both a horizontal and a vertical axis. Four types occurring alone or in combination exist: anteromedial, anterolateral, posteromedial, and posterolateral. Straight valgus instability is commonly the result of an external force applied to the lateral aspect of the knee. A typical clinical scenario is a football player who is struck by another player just above the level of the knee. Non-contact injuries can also occur, as in the case of snow ploughing while skiing. In either scenario, a valgus position of the knee occurs, resulting in a shift of the contact point from the central region of the knee to the lateral femorotibial compartment (Figure 10). Straight valgus instability is commonly the result of an external force applied to the lateral aspect of the knee. 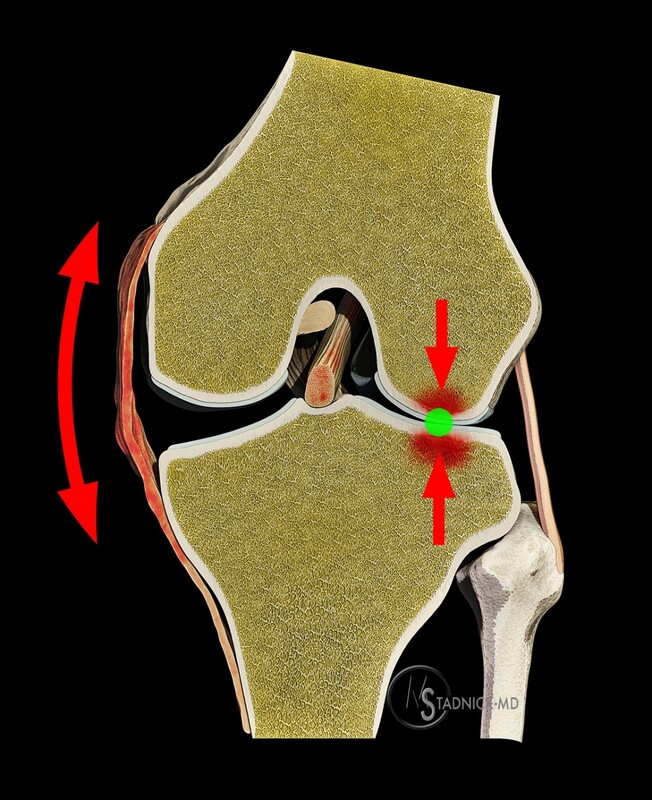 A valgus position of the knee occurs, resulting in a shift of the contact point (green circle) from the central region of the knee to the lateral femorotibial compartment. Compressive and/or shear forces produce injuries at the site of contact in the lateral compartment, and abnormal tensile forces produce injuries of the medial supporting structures and, to a lesser extent, of the anterior cruciate ligament. See text for further details. Tensile force on the medial aspect of the knee produces some combination of injury to the medial supporting structures, including the TCL, deep medial capsular ligament, POL, and medial portion of the posterior capsule (Figure 12). Coronal fat-saturated T2-weighted (a) and axial fat-saturated proton density-weighted (b) images demonstrate a straight valgus instability pattern of injury characterized by a complete tear of the tibial collateral ligament near its femoral attachment (long arrow), high-grade tear of the deep medial meniscofemoral ligament (short arrow), low-grade sprain of the posterior oblique ligament with adjacent edema (arrowheads), and intimate bone contusions in the lateral femorotibial compartment (open arrows). There is also anterior extension of the injury with tearing of the medial patellofemoral ligament and edema tracking proximally along the vastus medialis obliquus muscle (open arrowheads). The ACL may also be injured, although some epidemiological studies have shown that combined ACL/TCL injuries are relatively less common than isolated injuries (Figure 13).20,21 Compressive force on the lateral aspect of the knee relates to the contact of the lateral femoral condyle and lateral tibial plateau, producing an internal force that may result in a lateral meniscus tear (e.g., longitudinal vertical tear) and/or a chondral or osteochondral injury within the lateral femorotibial compartment. The resulting bone injuries in the lateral femorotibial compartment, whether they reflect a bone contusion (i.e., bruise), osteochondral fracture, or subchondral fracture, are intimate at the time of impact and remain intimate at the time of MR imaging, serving as injury footprints that are very useful in identifying this mechanism of injury. In those cases of a valgus injury related to an inciting external force, a second footprint, typically a bone contusion or fracture in the lateral aspect of the knee, is often found resulting from this external, or environmental, force. A 32-year-old female hit a tree and clipped the outside of her knee while snowboarding. Coronal (a) and sagittal (b) fat-saturated proton density-weighted images demonstrate a straight valgus instability pattern of injury characterized by high-grade tear of the deep medial meniscofemoral ligament (arrow) and a bone contusion in the lateral femoral condyle (open arrow). This case also demonstrates associated complete tearing of the ACL (open arrowheads). 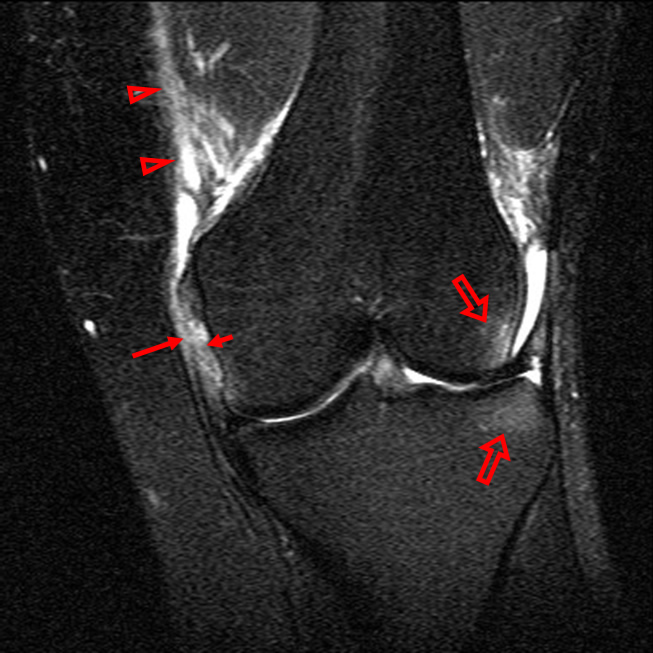 Subsequent arthroscopic images demonstrate an ACL stump (open arrowhead) (c) and hyperemic changes involving the deep medial capsular ligament (arrow) (d), highlighting that these injuries may be subtle at arthroscopy, as the surgeon is only able to see the inside of the knee, such that MRI and clinical exam become critical in the pre-operative assessment. AMRI results from valgus and external rotational forces applied to the flexed knee. These forces create excessive widening of the medial joint space with simultaneous anteromedial rotatory subluxation of the medial aspect of the tibia about the intact PCL. There is resultant injury to the TCL, deep medial capsular ligament, POL, and ACL. The rotational component of the injury leads to internal impaction of the femur and tibia, producing bone injury footprints that are contiguous at the time of impact but noncontiguous at the time of MR imaging when the knee is generally no longer rotated or, at the very least, less rotated. In patients with combined ACL/TCL injuries, bone contusions are most commonly seen at the anterolateral femur and posterolateral tibia (Figure 15).19,23 If there is also a concurrent medial meniscal tear, the combination of findings (tears of the medial supporting structures, ACL, and medial meniscus) is known as O’Donoghue’s unhappy triad. More complex injuries have also been described, including a tetrad lesion (triad lesion and additional injury to the MPFL) and pentad lesion (tetrad lesion and additional injury to the lateral meniscus or popliteomeniscal fascicles). Axial fat-saturated proton density-weighted (a), coronal fat-saturated T2-weighted (b), and sagittal fat-saturated T2-weighted (c) and (d) images demonstrate an AMRI pattern of injury characterized by a complete tear of the ACL at its midportion (arrowheads), complete tear of the TCL just distal to its femoral attachment (long arrows), partial tear of the deep medial meniscofemoral ligament (short arrow), an osteochondral fracture at the lateral condylopatellar sulcus (open arrowhead), and bone contusions at the posterolateral and posteromedial aspects of the tibia (open arrows). While injuries to the medial supporting structures are often divided into three grades based on clinical observations, including the results of stress testing, there is variation in the MR imaging criteria used for grading the extent of injuries to these structures. For example, in a grading scheme that includes both the TCL and the deep medial capsular ligament, a grade 2 injury would indicate complete disruption of the TCL but with an intact deep medial capsular ligament. A grade 3 injury in this scheme would reflect disruption of both the deep medial capsular ligament and TCL, and studies seem to suggest good correlation between MRI grading and instrumented laxity tests.24 Alternatively, TCL disruption can be classified by its site of injury (e.g. type 2 injury reflects disruption of the TCL at its tibial insertion).25 Although many radiologists refer to grade 1 injuries in the presence of soft tissue edema paralleling the TCL, grade 2 injuries in the presence of periligamentous edema and areas of ligamentous attenuation with focal or segmental areas of ligament thickening, and grade 3 injuries when confronted with complete loss of continuity of ligamentous fibers with or without capsular involvement (Figure 16), the classic three-grade scheme is better applied to the clinical assessment and not the MR imaging assessment of the medial supporting structures. Grading of injuries of the medial supporting structure on MR imaging is variable. Although the classic three-grade scheme is better applied to the clinical assessment, many radiologists refer to grade 1 injuries in the presence of soft tissue edema paralleling the TCL (a), grade 2 injuries in the presence of ligamentous attenuation with focal or segmental areas of ligament thickening (b), and grade 3 injuries when confronted with complete loss of continuity of ligamentous fibers (c), as demonstrated in these coronal fat-saturated proton density-weighted images. The medial supporting structures are best evaluated on coronal and axial MR images. Tears of the TCL most commonly involve its proximal or middle portion.27 Tears are accompanied by edema superficial to the ligament, altered intraligamentous signal, ligament surface irregularity or caliber change, and/or ligamentous discontinuity or retraction, findings that are dependent on the magnitude of the injury. Tears of the TCL may result in entrapment of the ligament within the joint, deep to the anterior arm of the semimembranosus tendon, deep to the meniscotibial ligament, or superficial to the pes anserinus tendons (i.e., Stener-like lesion of the TCL) (Figure 17). High-grade injuries involving the TCL and deep medial capsular ligament may be associated with superior or inferior displacement of the medial meniscus (e.g., distal tear resulting in superior meniscal displacement). Edema near the distal attachment of the TCL should be inspected carefully, as distal TCL injuries may simulate pes anserine bursitis. Additional causes of medial periligamentous edema include fluid leakage from a nearby bursa or popliteal cyst. (a) Illustration of a Stener-like lesion of the TCL resulting from entrapment of the torn TCL superficial to the pes anserinus tendons. (b) Coronal fat-saturated proton density-weighted image demonstrates a tear of the TCL at its distal tibial attachment (long arrow) which is entrapped superficial to the pes anserinus tendons (short arrow). 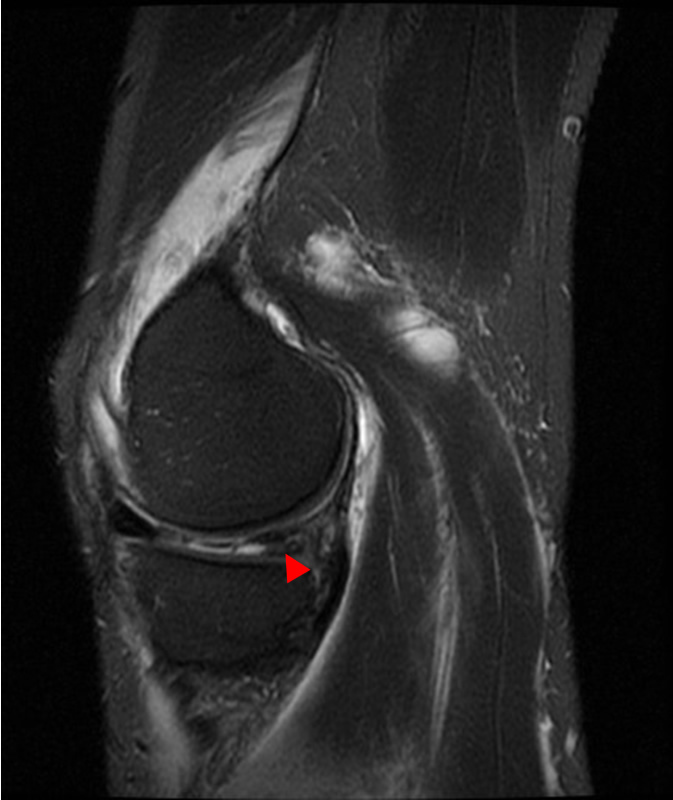 There is also a tear of the deep medial meniscotibial ligament at its meniscal attachment (open arrowhead), a lateral tibial bone contusion (long open arrow), marrow edema in the intercondylar eminence of the tibia (short open arrow), and an arthroscopically-confirmed complete tear of the ACL superiorly. In general, an avulsive injury at the site of osseous attachment of a ligament leads to little or no marrow edema in MR images, although there are exceptions to this rule based upon the precise anatomic characteristics of the attachment site. There are two patterns of ligament attachment to bone: 1) a direct attachment at which the ligament fibers extend into bone at right angles; and 2) an indirect attachment at which the ligament has obliquely oriented fibers. As one example, the deep medial meniscofemoral ligament has a direct attachment to the femur, and it is not uncommon to see extensive marrow edema at this attachment site related to an avulsion injury. Conversely, the TCL has an indirect attachment to the tibia, such that marrow edema at this attachment site is infrequent following an avulsion injury (Figure 18). (a) At direct attachments, ligament fibers extend into bone at right angles. (b) Coronal fat-saturated proton density-weighted image demonstrates marrow edema related to an avulsion injury at the direct femoral attachment of the deep medial meniscofemoral ligament (long arrow). (c) At indirect attachments, the ligament has obliquely oriented fibers. (d) Coronal fat-saturated T2-weighted image demonstrates an avulsion injury at the indirect distal tibial attachment of the TCL (short arrow) without marrow edema. Chronic injuries of the TCL may be accompanied by intraligamentous or periligamentous calcification and ossification, known as Pellegrini-Stieda disease (Figure 19). Although initially thought to form within the injured TCL itself, these calcifications are often seen proximal to the femoral attachment of the TCL. This latter finding may reflect injury to the adjacent adductor magnus tendon insertion or periosteal stripping of the distal femoral metaphysis.28 Another cause of calcification within or about the medial supporting structures is idiopathic calcium hydroxyapatite crystal deposition. (a) Frontal radiograph, (b) coronal proton density-weighted image, and (c) coronal fat-saturated T2-weighted image demonstrate chronic injury of the TCL accompanied by intraligamentous and/or periligamentous ossification, known as Pellegrini-Stieda disease (arrows). In another patient, (d) coronal T1-weighted and (e) axial fat-saturated proton density-weighted images demonstrate ossification proximal to the femoral attachment of the TCL, indicating injury to the adjacent adductor magnus tendon insertion (arrows). In the immature skeleton, physeal injuries about the knee may result from the same valgus mechanism that leads to ligamentous disruption in adults. Because the central portion of the distal femoral physis is normally the first to fuse (at about the age of 14-17 years), a medial physeal fracture with or without epiphyseal involvement of the distal portion of the femur is one example of a “TCL-equivalent injury,” an injury that is similar to a juvenile Tillaux fracture of the lateral portion of the distal tibial physis. Entrapment of portions of the nearby periosteal membrane or medial supporting structures (Figure 20) is a known complication of an injured and widened distal femoral or proximal tibial physis. (a) Coronal fat-saturated proton density-weighted image and (b) frontal radiograph of the knee in a 16-year-old football player demonstrates widening at the medial aspect of the proximal tibial physis with entrapment of the adjacent torn TCL within the injured physis (arrows). Injuries of the TCL can propagate both anteriorly or posteriorly to involve the anterior (e.g. MPFL) or posterior portions of the medial supporting structures. Injury of the POL often presents with meniscocapsular edema superficial to the posterior horn of the medial meniscus. 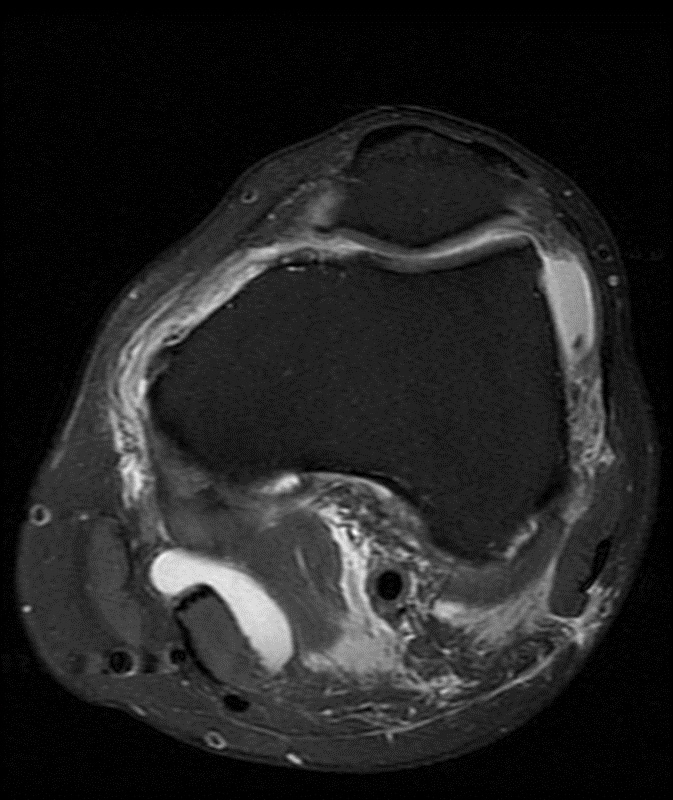 Injuries to the semimembranosus tendon and tendon of the medial head of gastrocnemius muscle usually produce characteristic findings with MR imaging. Knowledge of the anatomy and biomechanics of the medial supporting structures of the knee is essential to a complete understanding of those mechanisms that are responsible for injuries to these structures. Two of the most important of these mechanisms are straight valgus instability and anterolateral rotational instability (AMRI). Resulting alterations within and about the ligaments themselves and in cartilage, bone, and menisci produce the characteristic footprints that are often clearly visible in MR images.